You won’t be shocked to learn that watching Bernie Sanders shout about email is not virtual reality’s killer app. 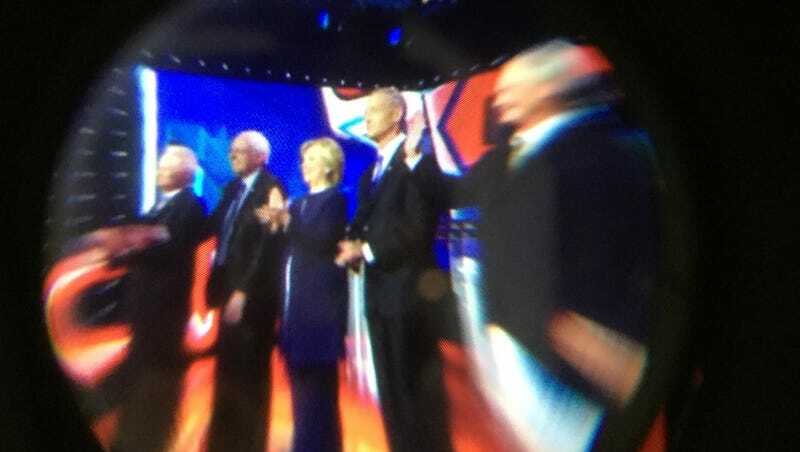 I watched Tuesday night’s Democratic presidential debate on my Gear VR, using Next VR in the Oculus store, and the aesthetic experience was markedly worse than watching the debate on TV, like a normal person. I know this because I shifted back to plain old CNN several times—when my Samsung Galaxy phone overheated, when the video froze, and when the novelty just plain wore off. Watching the debate in VR was like traveling through time to Campaign 2000, when the web was young and a bevy of startups introduced gee-whiz ways to watch the political conventions that nominated Al Gore and George W. Bush: 360-degree cameras! Select your own viewing angle! And just like watching those nascent webcasts, taking in the debate in VR subtracted from the conventional TV viewing experience, rather than adding to it. There’s a lesson here, I think, and it’s not just “don’t watch gimmicky live VRcasts of presidential debates, because you won’t even be able to check your phone for jokes on Twitter when you get bored.” I’m a VR believer, mostly. The debate confirmed my suspicion that VR will be an interactive medium, not a passive one. If you just want to watch moving images of a live event, it’s hard to beat television. It was cool, initially, to feel as if I had been transported into the room in Nevada where the candidates were debating, to look around the stage and see the lights and cameras and other aspects of TV production that are invisible on CNN. For a few minutes before the debate started, I was perched invisibly right above a man who was scrolling through messages on his phone. It felt a little voyeuristic, and it was oddly riveting. Once the debate started, however, and my perspective shifted to one of three unmoving positions on the CNN stage whose lines and colors seemed to be taken from the Ugnaughts’ Cloud City carbon-freezing chamber in The Empire Strikes Back, I wanted the ability to control where I went and what I saw. I wanted to move forward and backward and side-to-side as you do in a first-person video game, not to be rooted to a fixed spot on stage that changed according to the whims of a broadcast producer. In many VR experiences these days, you’re on rails, gliding through space in a starship or other vehicle as you crane your neck to witness the world that surrounds you. That’s tolerable, even mesmerizing when done well. But at an event like a presidential debate, with five people standing basically motionless behind podiums, and an audience that was essentially stationary as well, it’s excruciating. Although, I should add, it was kind of cool to see audience members stand and cheer when the camera shifted to a position behind the candidates (which happened rarely). That’s also how I was able to see Martin O’Malley’s bald spot. The novelist and games writer Naomi Alderman noted at the Guardian yesterday that many arts-and-humanities types seem unfamiliar with the work done by video games to pioneer new forms of digital storytelling. The VR hype is often similar: “Imagine a movie where you are the camera!” You mean a video game? If a viewing experience like Tuesday night’s debate is going to be better than the one I already get in my living room—watching TV, with my wife, able to talk to her while also connecting with untold thousands over social media on my phone—it needs to be more like a video game: interactive and social. For VR to take off, it needs to transport people’s bodies into virtual spaces, not just their eyeballs.